In all honesty is it nearly impossible to teach A3 Thinking on a website versus the way we prefer in live circumstances. A3 Thinking by nature involves actual observations, collection of facts and data points, interviews,analysis, and of course good problem solving skills. In addition it normally requires the assistance of an adviser for dialog, critique, feedback, and proper development of the individual writing the report. These type of conditions are not possible to duplicate in this medium. However, for the sake of introducing the basic concepts and for learning purposes we will highlight a sample exercise that one of the authors often uses for initial training. In order to appreciate the exercise you will need to step through a series of communications issued between Bob the learner and Tom Harada his supervisor and adviser and answer some questions at each step along the way. Since this exercise takes place during a business trip where the two parties are in separate locations the exchanges will take place in the form of e-mails / faxes exchanged between the two individuals for communication. The events are essentially from a real experiences that took place over fifteen years ago. The names, dates, and minor details have been changed etc. in order to turn it into a class room example of the A3 Thinking process. We hope that it will give you a realistic flavor of the overall concept and how it feels for new learners to create an initial one. The setting for this example is the start up of new engine plant (called TMM) in the state of Kentucky. The head company has successfully set up an assembly plant and is now looking to expand operations in the components area. Bob and Tom work in Kamigo plant in Aichi Prefecture that is in charge of checking up on the installation of equipment which is mostly from Japan, implementing training for skilled trades, ensuring the documentation and spare parts are in place, and in general providing overall start up support during the launch phase. Tom has a couple of decades of experience and has set up several plants before and is currently in Japan tending to multiple other assignments. Bob is a new employee in the company still in his first year and has been sent to Kentucky to observe the start up for training purposes and to provide some support where possible. Tom requested that Bob send him a status report at the end of his first week on site. The following exchanges are what occurred. For those interested, below is a sample of what the drafted A3 might look like for this example. There is no right or wrong answer here just different ways of depicting the situation for the requested report. These examples are by no means a the only possible answer for the exercise. The focus is on both improvement and development of better critical thinking skills on the part of the learner Bob as well as his ability to communicate his findings in an efficient manner. If you have a different or better way of writing up the requested report please give it a try! This exercise is intended to briefly introduce the basic components of A3 Thinking in a problem solving sequence. In reality we'd need to probe even further and ask some more detailed questions and be certain that the right countermeasures are implemented. This summary represents a mid-point in the process where there is sufficient material to communicate and exchange information now with other related parties, etc. Here are some additional questions that might help you improve your A3 skills on problem solving cases. Below are two lists of questions to ask at each step of the A3 reports. For simplicity we have outlined them in the form of an actual A3 so the Background, Current State, Goal, and Analysis questions will be in the first document (left hand side of the A3) and the action items, check, and follow up in the second document for the right hand side of the A3. 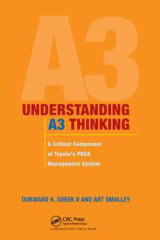 We hope this encourages you to learn more about A3 Thinking and to try it on your own.